I’m back from a wonderful family gathering and one of the first jobs on my list was to MOT my car. I popped the car into the garage but this time, packed my pens and sketchbook as there is a building close by that I have wanted to draw for quite some time. No 7 Brunswick street stands out as a reminder of what was once a street of elegant town houses. The building next door is shrouded in scaffolding at present but the English Kitchen was just the right size for me to complete in one hit, standing with my back to Jubilee Pool. Thanks to my friends who have encouraged me to get out there and draw – I completed the line drawing on the street and applied the colour at home. Here is the final sketch. Thanks for reading! No 7 Brunswick Street in full technicolour! 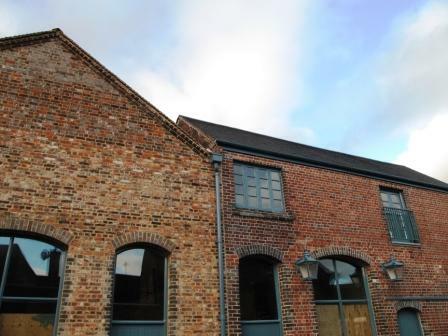 Mellard Warehouse is looking good! 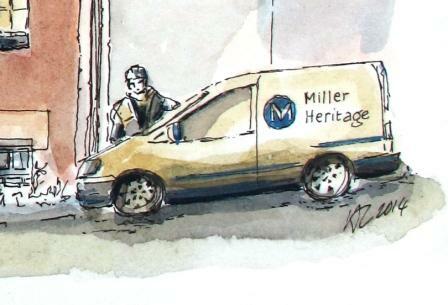 This post is dedicated to the lads at Miller Heritage – hats off to you gentlemen! 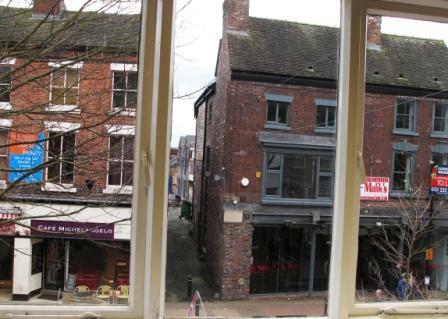 From the first floor of ‘Pockets’ you can see a narrow gap on the south side of the Ironmarket. It’s easy to miss but this is Market Lane and it leads down towards the bus station on Hassell Street. 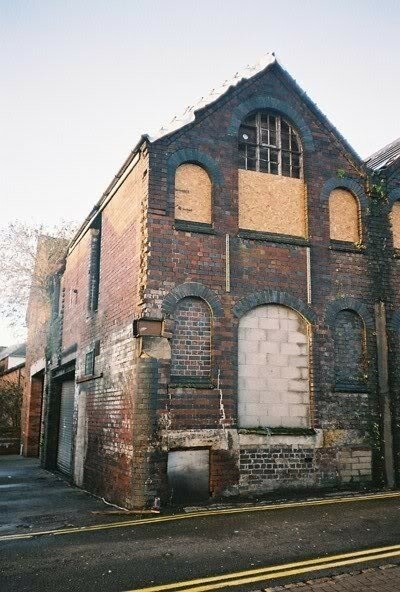 Once on Market Lane, it is also quite easy to walk past what has been up until 2013, a tumble-down warehouse, dating from around the late nineteenth century. However, it is worth taking a minute’s detour to take in the transformation, the difference is remarkable. 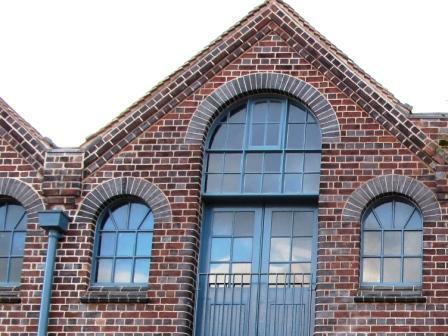 You can now see that this is a handsome old warehouse, with its subtle mix of Staffordshire red and blue bricks laid in English bond, a pattern favoured industrially during the Victorian period, with blue engineering brick arched lintols and stepped cills. 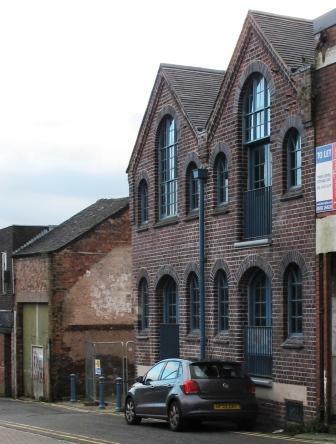 Thanks to the combined efforts of the owner (my apologies, I dont have your name), a grant through the NUL Town Centre Partnership Scheme , CTD Architects Leek and the Main Contractor, Miller Heritage of Wolverhampton, this building has a new lease of life. 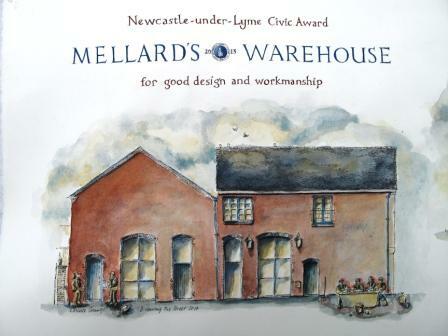 The work has been recognised by a Civic Award . Congratulations! Here’s wishing the building and future occupants every success and let’s hope that the view down Market Lane will soon be full of life, colour and activity. We won’t all fit in there! Take a look at this link to see just how far this building has come. Thanks for reading! The forecast is stormy but I am very excited by my week ahead. Tomorrow I begin my three year Icon Diploma course in Moele Brace, and have just set up a new blog site for anyone interested in following what I will be learning from Aidan Hart, one of the UK’s leading Iconographers (www.icondiplomastudent.wordpress.com). 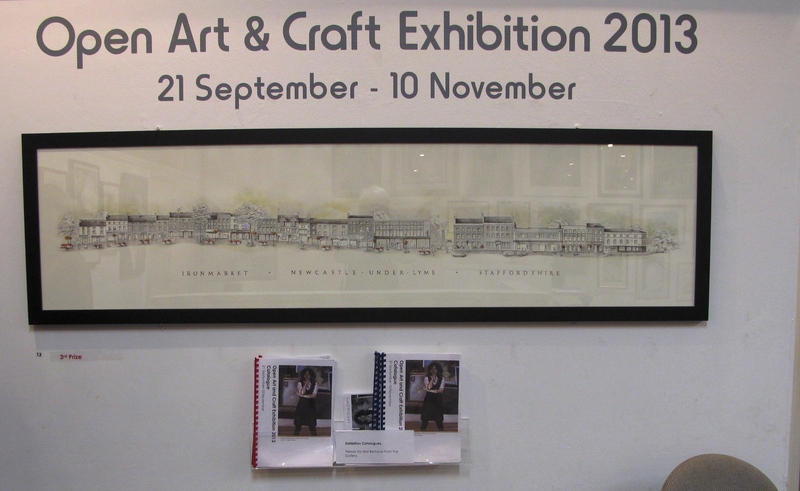 Then, next Saturday afternoon, 2nd November, I set up my first two week exhibition for Drawing the Street. 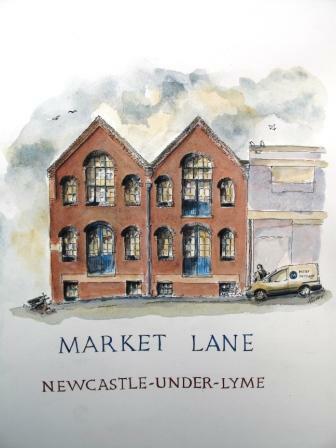 If you live in Newcastle-under-Lyme, please come along as I hope to have some of my better Newcastle drawings up for you to see, but you can be the judge of them! It will be up until 16th November. I must add here a couple of ‘thank yous’. One to Terry at Jollies Arts & Crafts for helping me to assemble the frame for ‘Ironmarket in Winter’ – it isn’t easy to frame a 2.7m drawing. Another to Kevin at ‘I wis Framed’ in Stoke, who has been damping and weighing down some of my buckled cartridge paper ready for framing. I’m also still recovering from the news that my ’Ironmarket in Summer’ was awarded a prize by the Friends of the Borough Museum and Art Gallery. I was truly delighted with this news! Thanks to the Friends and the Gallery. I have been getting my work printed with Smith York printers in Ironbridge and gradually trying out different methods and papers so that I can have a range of prints available to buy. Please note that when any work is displayed in a gallery, there is a commission to include but it all helps the economy. I also would like to add that quality and sustainability is really important to me and this is reflected in my choice of suppliers. I look forward to seeing some of you up at the library. 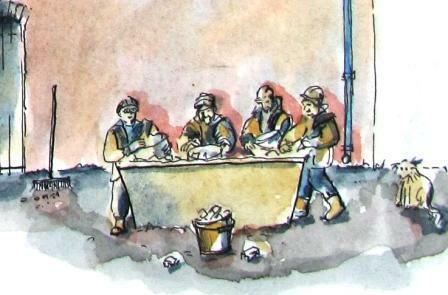 This is a section from my ‘Ironmarket in Summer’ drawing. 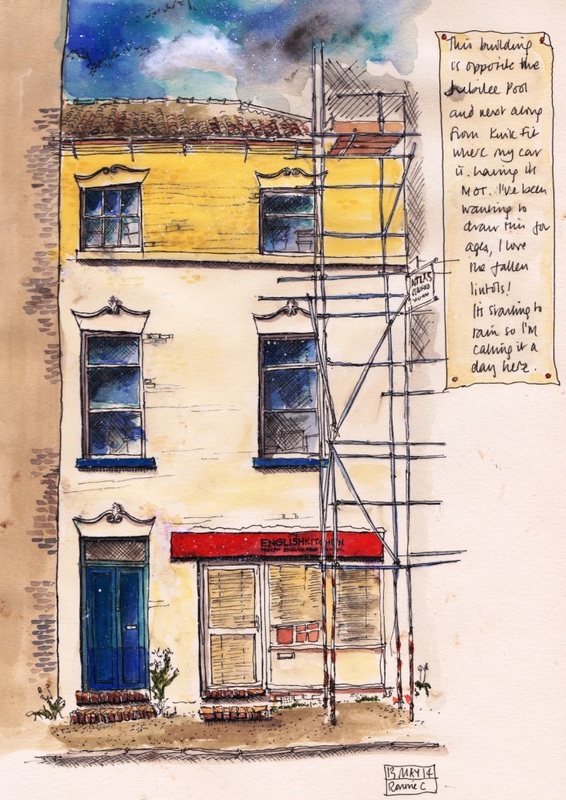 The geraniums in the planters and begonias in the hanging baskets all looked so vibrant that I decided to do a 60% reduced size summer version of my original 2.8m long winter drawing to submit to the Borough Museum and Art Gallery’s open exhibition. This time, I applied all the tips picked up in Dave Brammeld’s drawing classes and used a heavier 300gsm watercolour paper. 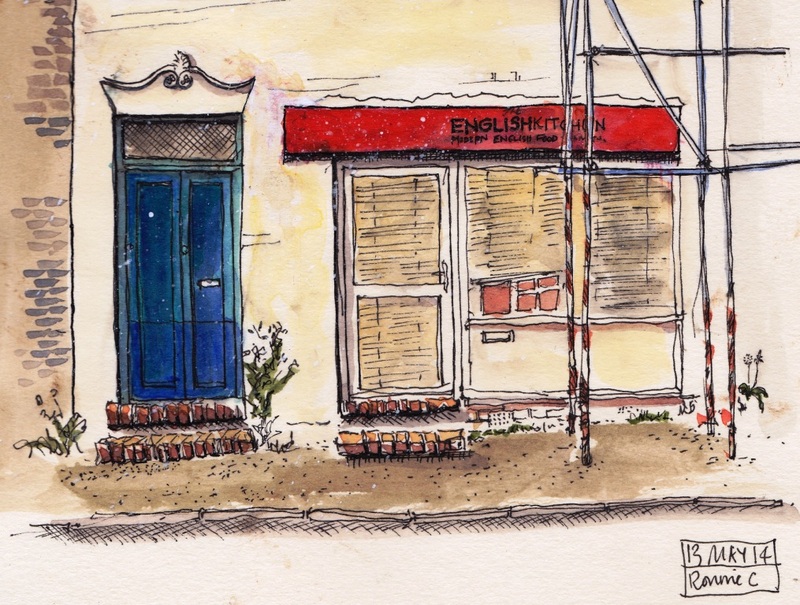 Most of the composition is in black and white, technical drawing pens Rotring .25 and .18 nibs, with Sumi ink wash. Colour highlights on flowers, windows and sky in egg tempera. The drawing has been selected and will be shown in this years exhibition. This is a lino cut print on to the same Fabriano 200gsm cartridge paper. Its a view of St Giles’s church tower from the corner of Merrial Street and High Street. 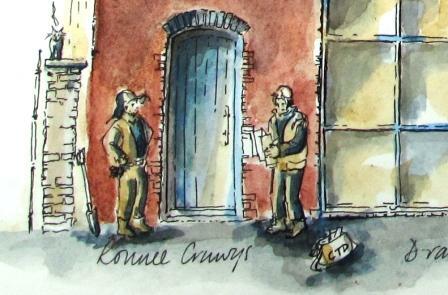 Same street, new drawing with ink on 200gsm cartridge to a larger scale. Water colour wash applied to compare with the egg tempera. Prefer the earth colours of the pigments in egg tempera but applying the water colour is less time consuming. Applied a few more washes to build up the colour. 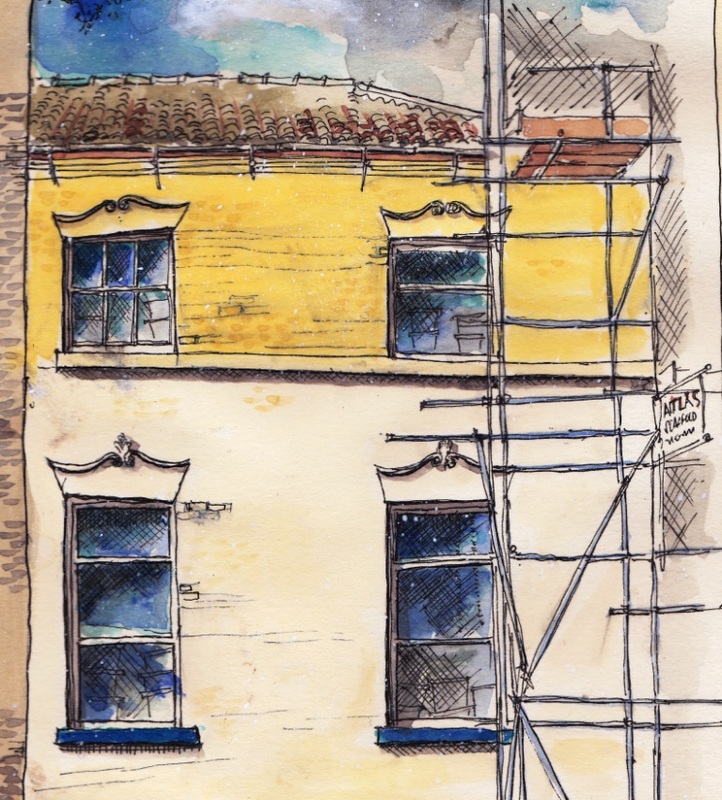 Several layers of egg tempera washes with a final glaze of yellow ochre applied over the full length of the street. Good to see that some examples of the original windows and a door remain, see Nos 17 and 66 Garden Street.